The tendency to see art and science as two distinct and antithetical spheres is the dominant way of viewing the two in contemporary society. Yet, as Jessie Florence Jones argues, it is only through creative attempts to bridge this divide, like recent exhibitions at FACT in Liverpool, can we nurture the revolutionary artists, and scientists, of the future. As an underdeveloped member of either the school of science or art, the temptation to divide the two, to see them as contesting forces, is strong. This, despite its naiveté, is understandable when a society increasingly becomes concerned with meritocracy and a particular sense of purpose. The benefit of a particular actor within contemporary capitalism has long been tethered to their function, their efficiency, and how much they might contribute to economic development. This, however, has started to shift. Scientific studies have started to influence art. Art itself has started to become a tool through which the most apposite questions surrounding AI, climate change, and globalisation have been presented to a society confused and bewildered by its own innovation. These two forces, art and science, are interconnected and indistinguishable in what they essentially aim to achieve: understanding reality, the universe, and one another. Greek philosophers understood this better than we do now. It is not nostalgia, but urgency, that I suggest compels us to continue to bind the two. As art illustrates scientific insecurities, science can save art from a growing political disregard. Bertrand Russell summarised this better than I could when he said: ‘science may set limits to knowledge, but should not set limits to imagination’. Here science, like art, is guided by playfulness, creativity, and wonder. A re-installation of this ‘imagination’ is what I suggest is a remedy to the increasing, yet hauntingly familiar, erasure of the arts. The current neoliberal climate, both in Europe and the United States, is following a devastating pattern of cuts to arts centres, adult programs, and creative subjects within schools. In a BBC survey, with 1,200 schools having responded, nine in every ten said that they would be cutting back on creative subjects, either axing them completely, or cutting down on lesson time, staff, and facilities. Schools told the BBC that the increasing focus on academic subjects, as well as funding cuts, was the main reason attention was being withdrawn from art. This is now an old and heart-breaking story. Hanif Kureishi traced this disregard back to the 1980s, illuminating its origins as something closer to disavowal than mere ignorance. Kureishi states that Margaret Thatcher ‘actively hated culture, as she recognised it was a form of dissent’. This is not an unfamiliar concept. Left wing theorists such as Theador Adorno and the rest of the Frankfurt School looked repeatedly at the commodification of art. This process, for them, robs art of what it is supposed to do. It stops art from being a challenge to power systems, instead, admitting itself mercilessly into them. This opinion highlights an age-old one: art exists to challenge, reflect, and illuminate. Art and revolution have consistently gone hand in hand. The ‘dissent’ Kureishi talks of is embedded into the very fabric of what it means to produce art. It is, after all, how a society expresses itself. Limiting art is motivated by one of two things: economic desperation or a more anticipative move towards a different kind of society. In a time of financial insecurity it would seem more likely that the cuts are purely motivated by money, motivated by a desire to ‘trim the fat’; anything that is not absolutely necessary to the maintenance of the country has to go. But this is in spite of the growth in the art market, 12% up from 2016, and money flowing in from tourism every year. Due to grossly uneven distribution of wealth, the elite make a lot of money from art. So it’s not that the arts are not fiscally viable; what’s disregarded is the people’s engagement with them. It’s that they’re dispensable when it comes to the masses. Elitist art institutions are not being removed from cities. But the community’s access to them is. In the past thirty years institutions like FACT in Liverpool have emerged as a retaliation to Thatcher’s ‘there is no such thing as society’, becoming increasingly concerned with reflecting that society back upon itself. 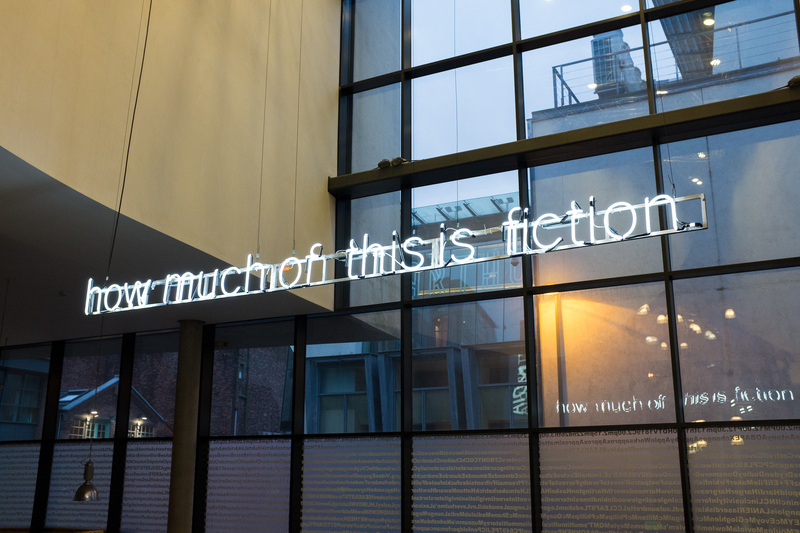 FACT is a centre dedicated to showcasing new media art, technologies, and the cross-fertilisation of the two worlds. Previous exhibitions include ‘How Much of This is Fiction’, an exploration of hacks, hoaxes and fake news in contemporary media, and the upcoming ‘Broken Symmetries’ which, in their own words, ‘[will bring] together artists who aim to understand and question the physical world by navigating the shifting patterns of modern science’. Their unification of the technological and the artistic extends to community programmes such as lectures, half term and summer camps for young people, and artist talks. Each strand of this project’s reach is predominantly concerned with contemporary society. Exploring this through the potentialities of combining science and art makes it a pertinent emblem for educational shifts. The opportunities with this kind of art not only centre around relevance but also the broader range of people it can attract. In this there a way we can undo some of the damage of these cuts by teaching people to look at science in the same way as art. To study these more academic subjects with a re-installed creativity. By looking at science, or more broadly ‘STEM’ subjects, with a curiosity and imagination, these critical skills cannot be lost. By no means do people passionate about ‘STEM’ subjects lack these critical skills; it is about encouraging a wider range of people to apply that creativity more broadly. In a school forced by budget constraints, funding cuts, and basic labour issues, it is simply about the rhetoric used when teaching children, rather than strictly the material that one uses. The message remains the same whether it’s music or chemistry that is being taught: look, question, dissect, interrogate, and attempt to answer the unknown. Reveling in the uncertainties of the universe unifies artists and scientists alike. This was something I really felt lacking in my school. It may seem rich to ask a state school, struggling simply to stay open, to assess the passion translated through its teaching methods. It may seem that when schools are at their most desperate, having to beg parents for donations just to function, enthusiasm is a lot to ask. But emotional investment, in every subject in school, is the only thing that cannot be directly stolen by a ruthless government. It can, however, be ignored into obsolescence. If we can give future generations an enlightened perception of creative potentialities in the sciences, as well as humanities subjects, we are creating the revolutionaries of the future. The skill set itself is something essential to the very essence of what it means to be human. Curiosity, experimentation, and creativity, are all woven into the fabric of personhood. Without the proper outlet however, these are at risk of being bullied out of children as they go into adulthood.